Description: This is a large stamp from All Night Media of Tinkerbell. It may be hard to see but there are swirls of pixie dust all around and below her legs. Add magic to greeting cards, scrapbook pages and gifts with this enchanted character. 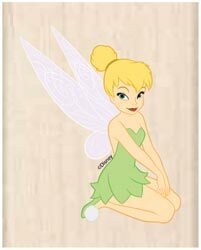 Size: 3" X 4", image is 2 1/2" X 3 3/4"
Description: This is a large stamp from All Night Media of Tinkerbell. She is very cute with flashes of pixie dust behind her as she charms a butterfly. Add magic to greeting cards, scrapbook pages and gifts with this enchanted character. Description: This stamp comes from EK Success. 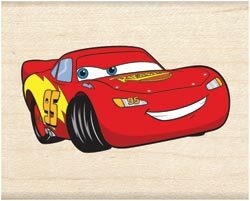 It is of the Disney character Lightning McQueen from the movie Cars. This is a great stamp for any fan of the movie Cars! Size: Image size is 2" X 1"
Description: Very nice Tinkerbell stamp from EK Success. Classic features and nice size. Get this one for the Tink lover!! Size: Image size is 1 3/4" X 2"
Description: EK SUCCESS-Clear Stamps: Disney's Tinker Bell. Easy to use; easy to clean and even easier to store! These fabulous clear stamps of Tinker Bell along with flowers; leaves and PIXIE PERFECT; FLY BY ATTITUDE and TINKER BELL titles are sure to enhance all of your "little Fairies" scrapbook layouts and much more. Tink measures approximately 3in tall in each of these four Tinker Bell stamps. Package contains eleven stamps. Requires acrylick block sold separately. So easy to use... just peel them off the clear backer sheet and position them on a clear acrylic block. Once you are done stamping, clean the stamps and let them dry. Return your stamps to the clear backer sheet for storage.